Back in the summer I bought four generic, blank (I assume) Motorola brand smart cards from Active Surplus during my vacation to Toronto. Over the past few weeks I’ve been doing some research and hands-on testing of what this card is (in)capable of doing. The card itself is an ISO 7816-compliant smart card that uses the asynchronous (UART) T=0 byte-wise protocol and communicates using industry standard APDU (application protocol data unit) commands. The card is a dual-interface card; it has the standard six-contact chip and also has an antenna for RFID. 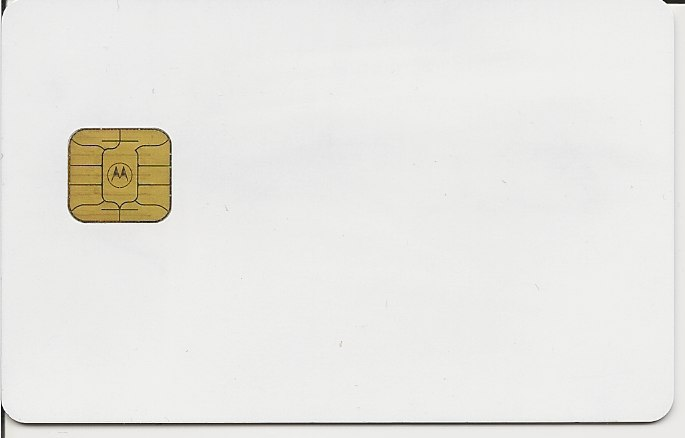 There is an antenna coil 3 windings wide around the perimeter of the card and connects to the chip itself. So far I have not had any progress in getting it to contact an RFID reader, but hooking up an LED from the chip’s Vcc to ground causes it to flash when brought up to a BlackBerry Bold’s NFC antenna. The chip has an answer-to-reset of 3B 76 13 00 00 80 62 07 41 81 80. When parsing this via the PysCard smart card library (http://smartcard-atr.appspot.com/parse?ATR=3B76130000806207418180) the site identifies it as a “Generic mass produced Motorola smart card” which doesn’t get me any further than what I already know; the Motorola logo is in the center of the darn chip! Current attempts to make use of the card have been unsuccessful. It responds with 0x6D00 (unknown command) on pretty much every industry-standard command I try. The only command that doesn’t give this is 0xC0 00 00 00, which is the “GET RESPONSE” command which returns 0x6F00 (generic error, no details available). I think that the card may simply be unprogrammed and is merely running a bootloader to install firmware on, but since many smart cards have mask ROM, there is a chance that the card is of pretty much no use. But hey, for 50 cents for a smart card it’s no big loss. If you know anything else about this smart card, gimme a shout in the comments section. I’ll be posting more updates as I find out more about this peculiar piece of plastic. This entry was posted in Smart Cards, Uncategorized and tagged 3B 76 13 00 00 80 62 07 41 81 80, 3B76130000806207418180, dual-interface card, experimentation, generic mass produced motorola smart card, generic motorola smart card, rfid, smartcard by ginbot86. Bookmark the permalink.